Matmos - the electronic duo comprised of Drew Daniel and Martin Schmidt - have been creating, constructing and collaging sonic ephemera since the mid 90s. With each album they release, Daniel and Schmidt seem to have thrown each other a gauntlet, between them creating compositions based around the collection and processing of particularly unorthodox sounds. 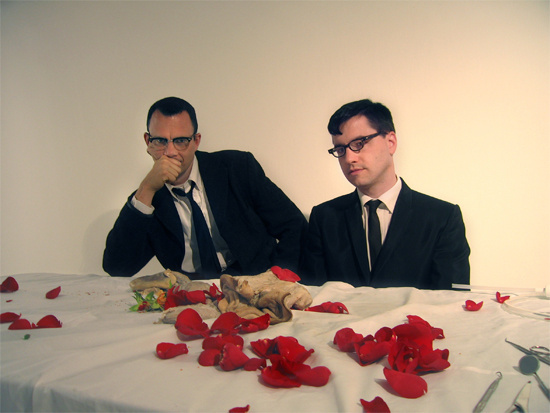 Sometimes compared to artists like Steve Reich, and certainly to Pierre Henry (the 'father' of Musique Concrete), Matmos have created albums entirely from the sounds of surgery (A Chance To Cut Is A Chance To Cure), used the sound of a bovine uterus (on their venerative album The Rose Has Teeth In The Mouth Of A Beast which pays tribute to notable queers), and on their first self-titled effort sampled the nerve signals of a crayfish. As ambitious as their projects have been in the past, Matmos' new album may just represent their most difficult challenge to date - and certainly their most esoteric. The Marriage Of True Minds', so far four years in the making, sees Daniel and Schmidt moving beyond the sound of creatures or surgery for their sonic palette. Instead, they used the minds of composers, comrades and the occasional scribe - including your humble narrator - through a series of psychic experiments. In these experiments Drew attempts, under 'psientific conditions', to transmit the concept of the new album into their subject's mind. The band then record the perceived messages heard, and at least attempt to use those as a basis for composing pieces. However, the outcome of these experiments are still uncertain, as Schmidt and Daniel continue to examine to actually make this behemoth of an idea work. The Quietus caught up with the duo as they waxed lyrical about the new album, synthesisers, noise warehouses, Throbbing Gristle, and upsetting modern occultists with their non-committal commitment to psychic research. Good evening, Messers Matmos! What have you been doing today? Martin Schmidt: Synth building! [We formed] a little company, or it started, or... I don't even know if it's legit to call it a company. We had an idea for a sound processing box: an exposed spring reverb with a filter, LFO and a mixer section on it, and I just happened to be good friends with a young Swedish guy who has the skills to actually build such a thing in a very solid electronic fashion. He built one and we loved it, and now we've actually sold like 400 of them worldwide. So our new thing is a synthesiser, and it's finally to the prototype stage where I can actually sit and play it. It's got a lot of weird things about it so I have a lot of notes for Karl the Swede. So do you have a mountain of synths? MS: I'm not actually a huge consumer of gear. MS: I prefer to get something and then really work it into the ground for a long time. One synth I use I've had since 1984, which is a Roland SH 101, and I'm not tired of it at all. It's important to not throw away your three year old things just because there's a new thing because that's not what a musical instrument is. Drew Daniel: I also would say we reject the sort of organic ideology of modular fetishism for its own sake. I think the interesting question is the question of poetics. Why is your song shaped this way and not that way? Why did you make these choices and not those choices? Too often people turn the recipe into the cake - they talk about someone and say 'oh, they use retro synthesisers and that is what their music is about'. I don't see why that should be the case, and in fact if you compare Kitaro to Throbbing Gristle, you might find that some of the same gear is being used but it's expressing visions of humanity or inhumanity that are going in completely opposite directions. Figuring out that direction is what is compelling. I always pictured you guys as having a massive store of gear? DD: We've gone through a lot of generations of equipment and there have been enablers... friends of ours who helped us make certain leaps and certain jumps. As a result I'd say our studio does resemble an Ali Baba's cave of flutes and contact mics and odd instruments. I don't know many other people that own 19th century fairy bells. So what sonic oddities do you have in store for us on the next album, The Marriage of True Minds? DD: We're at a strange place in creating that record, because it requires a lot of elaborate experimental set up. So far it consists of re-enacting experiments in telepathy with various participants. We have them come to our house, lie down and listen to white noise on headphones whilst we cover their eyes with ping pong balls and shine a light in their face. We're basically re-staging the experimental conditions of telepathy research in the 60s where they were trying to effect a kind of sensory deprivation so the subjects weren't seeing or hearing. The only substitution we've made is that instead of trying to send a simple graphic image, I try to transmit the concept of the new Matmos record from my mind into their mind, and we record what they generate in these sessions. We take these transcripts and have to then turn that somehow into music, and that's the fascinating, difficult, maddening but also fun part: how you turn a transcript of someone saying something very open ended and decide it means this kind of instrument, this kind of interval or this kind of tempo, or that kind of tuning. And it's always different depending on what you get in a particular psychic session. It depends on the person and their knowledge of how to talk about what they're experiencing. It's been a lot of fun but it's also really scary because we could spend decades doing this. We've been working on it for four years now and we're definitely not finished by any means. How many sessions have you conducted? DD: We did 15 or 20 in Baltimore, around 25 at Oxford, we just did a collaboration with about 25 people in Haverford college, and we've done more since we've been back in Baltimore - probably about 50? Each one generates a transcript and we've been deciding whether we make songs that are based on a particular transcript, or we take patterns that are repeated across many transcripts and treat that as one source. It's a big relief when someone says 'I'm hearing a stringed instrument' or 'I hear trombones'. Other people perceive primary geometrical forms or extremely specific narratives that are quite strange. So it's a real challenge to make it compellingly musical but also compellingly rooted in the psychic encounter. Do you think you're successfully transmitting your concept into people's minds? DD: I can't comment on it until we've completed the project, and it seems part of the project that I can feel that the transmission only occurs psychically. MS: He won't even tell me, for example. I can see why you need to be cagey, or the whole Quietus readership will know your secret. You're welcome to, if you like? DD: OK. Just relax and count down, 20, 19, 18... down to zero and when you hit zero I will attempt to transmit. DD: Describe to me what you're seeing in your mind? So, Drew, as an academic and a musician, what is your interest in telepathy? DD: Well, for me, the metaphor lends itself to situations in in my daily life. When you're in the classroom and you've responded a certain way to a poem and you're trying to get people to see what you see in that poem, for example, you get this weird feeling of having something in your mind that you're trying desperately to make arise spontaneously in the mind of someone else. You don't want to feed it to them in a 'leading the witness' way, you just have this longing to transmit. And I think sometimes in a romantic relationship it's the same. I think telepathy seems like a way to turn that into theatre or spectacle but also a scientific experiment. I like the push/pull between things that look like magic and things that look like science. And being an artist or musician we're sort of permitted to play with that ambiguity. Do you actually believe your telepathy is effective? DD: I don't think it matters much if I do or don't believe in telepathy. Maybe that's a cop-out, but I think getting hung up on the proof or disproof seems circular. That's the way the game is played in our culture: kooks and believers on the fringes do experiments that verify their beliefs, and then cold empirical rationalists and debunkers reconfirm the tracks on which our society runs. And nobody really is threatened by that cycle, everyone is comfortable with it. I've been looking at older writings on telepathy that are from a different era in science, or even Houdini - a year after his death his wife conducted a seance to see if he was able to communicate with her. It comes from a similar longing [to see] whether one mind can influence another mind - two living systems in a room. Given my interest, as a literary academic, in trying to understand texts that are 400 years old, I'm certainly sympathetic to that desire to cross over, or speak across that boundary. I like the way that musical performance has elements of listening intently, everyone becoming open to their perception. There are ways in which live performance are like a seance, we've been trying to exaggerate that. Why try to turn your interest in psychic 'attention' into an album? It seems to be very involved. MS: [interjects] We've had a conflict about this one. I didn't think he was being literal enough in the interpretations of the psychic sessions. At any point, have you wished you were doing something more specific and literal because you'd have an album by now? Have you had other ideas in the meantime? DD: Well, there have been points where we thought we were making a piano record and then it just morphed and became a civil war. Certainly there are a lot of improvisatory, rooted-in-jazz like structures, pieces that we've developed and that we've enjoyed playing a lot live, which we've thought 'well, that might also be its own record'. These aren't rooted in the psychic project but more by being in Baltimore and surrounded by free improvisers. So it wouldn't surprise me if in addiction to the psychic record we also completed a more organic and rhythmic work. Martin, what have you been doing aside from this album? You're quite into improv, aren't you? MS: A few things have happened simultaneously when we moved to Baltimore. The Baltimore that I move in is very oriented towards improvisation. The first venue that we played in here is mostly a free improv venue, and the people that hosted us have now become some of my best friends. So to fit in with my new community I've tried to do more and more free improv, and it's a really exciting generative thing, and especially a new challenge for electronic music. OK, so you've been doing improvisation, and the research sessions: how do these contribute to the gigs you've got upcoming? What will you be doing on tour? MS: Good question. We really should have a better answer for that than we do right now. DD: What we're going to do is try out some of the structures that have emerged through the telepathic project, but factor in having Jay Lesser in the band, which usually means linking many synthesisers together. He's going to bring the modular rig that he's been building for years. So there'll both be a sort of synthesiser/guitar aspect but also a sort of occult or ritual aspect that's rooted in the telepathy experiments. We want it to involve a certain amount of possible audience participation: we've been working on ways to do that that are both sonically compelling, but not corny, but also open to risk, because of course giving an English person a microphone is extremely dangerous [laughs]. I think that transfer of power is part of what makes me excited but also really nervous about it, but I think that's also why we want to tour. We don't really relate to that stale, safe approach to electronic touring where you've just got your piece, and that's your piece, and you're good to go. I really like that white-knuckle aspect of it. I hope the audience does. MS: Did you mention that we'll try to pull all of the shows off in quadrophonic? Has it been difficult to plan for that? MS: Unfortunately it just becomes a sort of bureaucratic management, trying to talk the venues into agreeing to put a second PA on board. DD: It's a compositional decision too - it's not just about putting four speakers in place and making sure they all work, but about deciding how you bring the audience into awareness of that fact in a way that isn't just cheesy, but actually makes them experience something special that they could only experience in that space. I think now, we have to justify why you go to a show even more. Music is so omnipresent and so devalued in so many parts of the public sphere so you have to insist on something perceptual about the performance that could only happen there, and quad is one way of making something particular and site specific. Also on this tour, we've got John Wiese opening for us, and he'll be playing in quad as well. His approach so often involves some very sudden abrupt cuts in volume and I think its going to be a really interesting, heavy duty way to begin the evening. MS: We'll probably also play with him. MS: It's going to be a by-the-seat-of-your-pants business. We don't just play music, we also set up a movie theatre, in that there's always video projection, and then we're building a kind of PA system that isn't usually what is in the venue. And I don't say that to brag, because sometimes it fails... makes us stumble, and error, where if we had a more traditional fool proof system we could probably guarantee whatever quote unquote a better show. But our goals are higher, so that supposedly when it pays off, it pays off at a higher level. MS: Or that we were brave and unembarrassed enough to actually just play laptops. DD: But we just aren't. You mentioned TG earlier: have you always been fans...? DD: Yes. I'm such a Throbbing Gristle fan that I wrote a book about them. I have loved them since I was a teenager and into punk rock - I bought them by mistake because I thought the name sounded like a punk rock band. So I bought a record expecting punk rock and put on the Second Annual Report, and it completely re-calibrated my aesthetics and literally gave me a terrible headache. I thought I was inured to that level of intensity, but they just hit a whole other set of frequencies. So yeah, I'm a ridiculous cheerleader for the TG approach. And it's interesting when I listen to new noise kids working now and try to figure out what it is TG did that has been so generative. But I don't want to imprison people working now in some idea that they were preempted by TG necessarily - that's the bad baby-boomer rock critic model of 'Dylan did it better'. I don't want to hold 18 year old kids in noise warehouses to the fact that there was quite a lot that TG already accomplished. DD: Yeah, Baltimore is a really fertile place for noise. There are warehouse spaces, squatted buildings or just houses where a bunch of kids live and hold shows. Like, last night we went to see a concert in a place called The Bank in a pretty rough part of the West Baltimore ghetto. We played a benefit to help them get a PA because they didn't really have a very good sound system. It's been educational for us to come here and try to get to know people in that scene and think about how poverty and related limitations affect the form of what people do. Like, nobody at The Bank shows up and plugs in a laptop and plays files or Ableton or whatever; most people are playing weird gear often that they've built themselves. There's a lot of circuit bending. DD: Well, I think I was 16 when I bought Scatology and the liner notes struck me as this incredible model for how to A) make incredible music but also B) release this sort of syllabus, a set of conceptual clues that allude to something within the music that you're supposed to listen for, and Coil's model for how to do that I found really ravishing. It helped that the music itself was really gorgeous and worth wondering about, but it was also this great flagrant demonstration of a queer couple creating in this suggestive and yet very esoteric way. I mean, it's the right amount of information and the right amount of mystery. There was a very blatant relationship between several members of Throbbing Gristle and the occult/esoteric. This project is obviously esoteric but it's not necessarily occult, I was wondering what your relationship to all of that is? DD: Well, Martin spent a lot of time in industrial bands in California, in the heyday of the era when people were affiliated with Crowley and the OTO, and Martin always had a rationalist sceptical 'not my cup of tea' attitude to all of that. For me, I've always been fascinated by it but also more attuned to it as a kind of poetics of living in the world. Magical thinking is essentially to my mind a set of supercharged metaphoric systems, which allege that there are correspondences between different levels of reality and that you can alter one level by intervening on another level. I find that an aesthetically beautiful and compelling world view. It's tied together in what a song can be - if you agree that a song can mean chant or spell - so there are ways to bind together these different levels of explanation. Now that you're actually involved in conducting psychic experiments of your own, how do you feel about the magical potential in what you're doing? DD: There's a certain bracketing of that. I got into an interesting argument about the album with Stephen Thrower, who was a member of Coil. He was saying 'Why don't you take the scientific aspect of what you're doing more seriously? You really could prove or disprove something here. Why don't you stop making art and really dig into proving something?' We argued about it back and forth, but I put my cards on the table: what I'm trying to do is create something out of this situation rather than to analyse it, in order to say 'Yes, these forces do exist' or 'No, they do not', because there have already been plenty of people who do that, and are frankly better scientists that I. We're very strict about the conditions always being exactly the same; we're repeating an experiment, but, the framework is in order to make art. An experimental setting grants the context for a certain kind of content to appear and that content is going to help us to create music. But you don't invest one way or another in whether or not it is in fact psychic? With me or in general? DD: Well, both! Part of it is that there needs to be a record that we can release into the world that can to fight to survive on its own terms, and not be weighed down with expectations that aren't capable of being satisfied. I suppose it's gong to suffer or benefit from adoption or rejection based on people's prejudices or views on this kind of topic, but I'm hoping we can open up a metaphor for what it means to send something from one mind into another mind into a way of thinking about making music with people. Listening to records, being in a band, being in a couple - they all hinge upon this possibly impossible goal. To me, it's a juicy subject that isn't necessarily tied to belief or disbelief in telepathy. It goes sideways. I should probably let you guys get on with your evening..
DD: But I never told you what happened in my day - Martin told you about his day. My day started getting my seventh tattoo, a Renaissance emblem from Erasmus's adages, 'hastens slowly' which is represented emblematically by a circle with an anchor and a dolphin wrapped around the anchor. I got that tattooed on my sternum this morning, it was excruciatingly painful. So it's number seven - are the other six as conceptually as important as the seventh? DD: Yeah, I guess they're a diary. As you live you change what's important. Some have a memorial function, to a person or an infatuation; sometimes [it's] an intellectual one. I have fairly pretentious highbrow tattoos as befits an English professor.